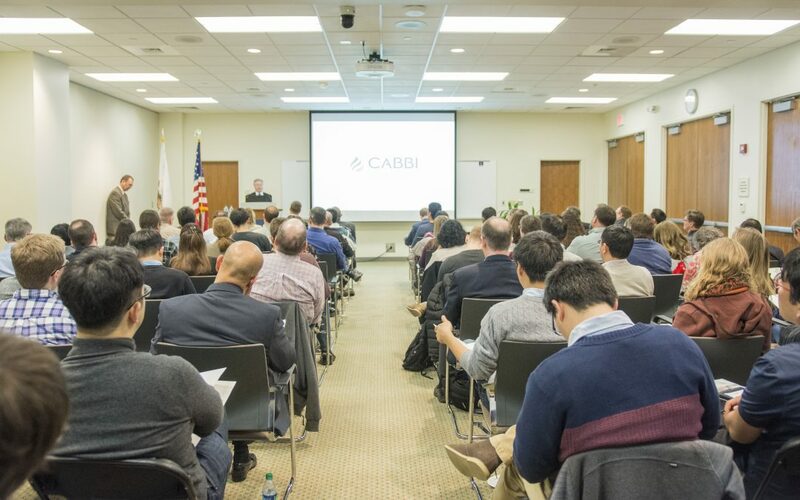 The Center for Advanced Bioenergy and Bioproducts Innovation (CABBI) officially launched as a new U.S. Department of Energy Bioenergy Research Center with a celebration on Feb. 1, 2018, at the Carl R. Woese Institute for Genomic Biology (IGB), followed by a science meeting on Feb. 2 at the I Hotel and Conference Center. More than 100 scientists and staff from Illinois and its 17 partner institutions — as well as government and campus dignitaries including Chancellor Robert J. Jones — attended the Feb. 1 celebration, which was emceed by CABBI Director Evan H. DeLucia, the G. William Arends Professor of of Integrative Biology at the University of Illinois at Urbana-Champaign and the Baum Family Director of the Institute for Sustainability, Energy, and Environment (iSEE). U.S. Rep. Rodney Davis, R-Illinois 13th District, a supporter of the 857-page proposal the University of Illinois and 17 partner institutions submitted in 2016 to the U.S. Department of Energy, offers congratulations on landing the $115 million grant. Visiting scholars check out the IGB labs and core facilities where CABBI postdocs and graduate student researchers will do their research. Visiting researchers get a look at the Illinois Biological Foundry for Advanced Biomanufacturing (iBioFAB), a core element of the CABBI Conversion Theme. Conversion Theme Leader Huimin Zhao explains how automated design will allow more time to focus on scientific analysis. Sustainability Theme Leader Madhu Khanna discusses how that theme will examine ecosystem, land use, and economic viability and resilience to determine the best crops and products to produce. Feedstocks Theme Leader Stephen Moose discusses the way newly engineered grasses will be developed to increase yield efficiency, storage of carbon in stems, and even resiliency such as more tolerance to cold. Visiting scholars check out a greenhouse at the Illinois Energy Farm, where Illinois Assistant Professor of Crop Sciences and CABBI researcher Erik Sacks discusses breeding of Miscanthus and energycane. Visitors examine the new biomass boiler at the Illinois Energy Farm. Visiting CABBI scientists get an overview of the Illinois Energy Farm — and the projects already housed there — from Illinois Associate Professor of Plant Biology and CABBI researcher Carl Bernacchi. CABBI researchers get a tour of the Integrated Bioprocessing Research Laboratory (IBRL), still under construction at Illinois. Once open in May 2018, IBRL will serve as a site where bench-scale processes may be scaled up significantly to demonstrate their usefulness to industry. CABBI Director DeLucia offers a champagne toast for the CABBI launch. CABBI scientists begin their kickoff meeting on Feb. 2, 2018. CABBI Feedstock Theme members discuss first-year research objectives. CABBI Conversion Theme members discuss first-year research objectives. CABBI Sustainability Theme members discuss first-year research objectives.